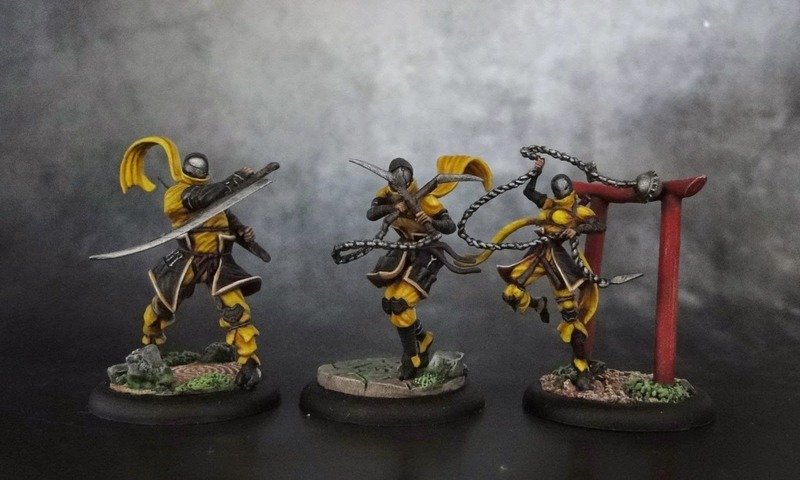 I haven't really had many opportunities to use yellow color while painting miniatures. I think my gritty style doesn't really go well with it. 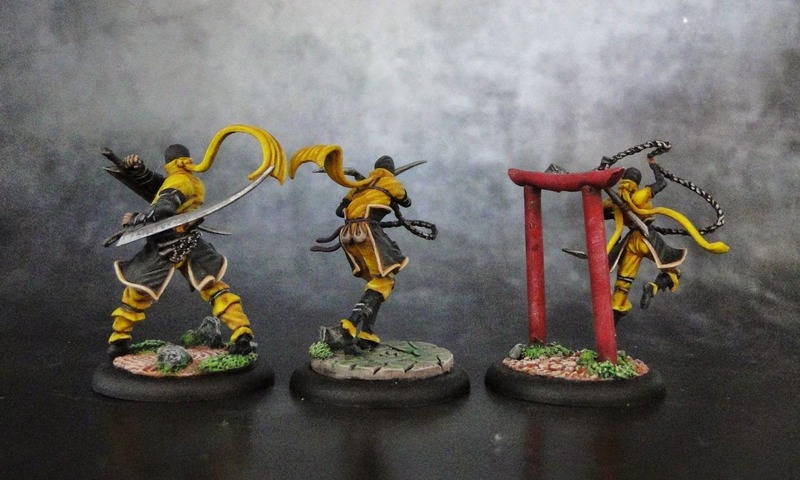 That's why painting the Torakage proved a challenge. I wanted to stay close to the original artwork and its vivid yellow but at the same time I felt I won't be able to completely forget about my painting style. Putting them together was fast and easy as all the individual bits fit nicely together. Not much GS was needed. I has a slight problem with the largest one as he barely fits a 30mm base to pinning him to it wasn't easy. I also decided to glue the smallest one in two places as she simply wouldn't last glued just by one small foot. The main challenge was that yellow has very weak pigment. At least the paints I used do (Army Painter, Reaper). GW's base yellow paints (I still have half a pot of Tausept Ochre and Iyanden Darksun) helped but they were still way too dark. It took numerous layers to build the shade you can see in the picture. At the same time, I didn't want the black parts to be too dark and placed a few highlights there too. In the end they turned out OK I guess, The yellow is rich and saturated but not too vivid and doesn't stand in too much contrast to black. Bright colors on bases also helped with maintaining this balance. Wonderful work! I like how your yellow looks like. My style too is dark and gritty, but it's a useful experience to try something else from time to time. Thanks Ana. I know, it's hard for us "dark" painters to switch to something more colorful and vivid. But it's a very interesting experience. The only downside is the amount of time I had to put into painting these. Getting the hang of using yellow took longer than I had expected. However, the advantage is that it should go smoother with other TT minis I will be painting next.